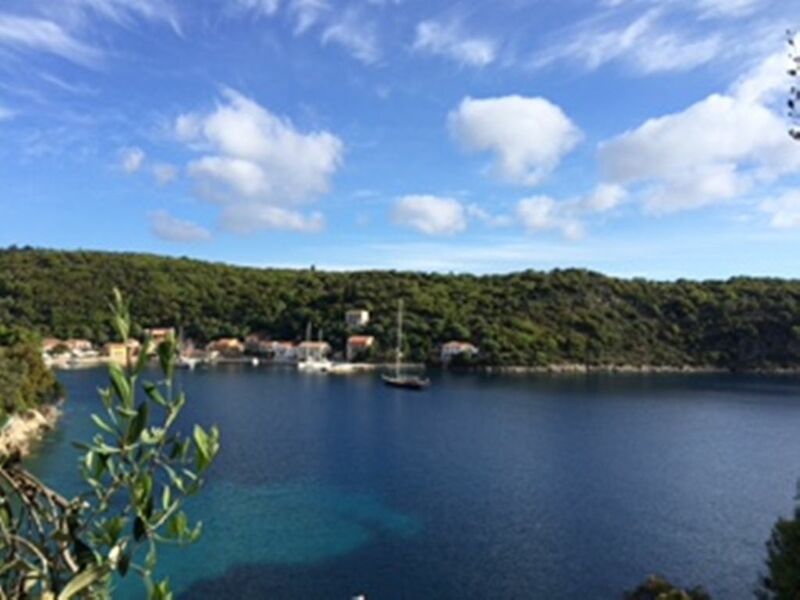 Located within 5 mins walk to the gorgeously quaint harbour village of Kioni, with its traditional restaurants attracting the many yachts, this house offers a tranquil and scenic Ionian "get away". The garden, with its 3 tiered terraces, is set within former olive groves, provides a stunning panoramic view across the sea to the windmills that characterise the entrance to the bay. The sea, and its pleasantly shaded coves, is within a couple of minutes walk affording the chance to swim and sunbathe whilst coming and going back to the house as one pleases. The upstairs consists of a double bedroom, shower and bathroom, open plan kitchen / living room. Tall French doors open onto a balcony with its sea view. There is a separate double bed annex down below with its own bathroom which opens up onto its own sitting out area again looking over the bay. The house is well furnished with washing machine, fridge and cooker. We had a new outside dining table made last year by the local carpenter which we keep on the first terrace where we tend to BBQ. The garden stretches back some 100 metres to natural olive groves where the chime of goat bells can often be heard in the distance. Vathi, the capitol, is a 45 min drive away. Stavros, a pretty hillside village from where one can explore Homer's Odyssey, is 20 mins away whilst Frikes, another small fishing village also popular with yachties, is 10 mins by car. There are many hillside walks nearby which are particularly stunning in the spring. The house is primarily for our own use so it is well stocked with everything you will need to enjoy all the delights that Kioni has to offer. The harbour area includes a number of waterside taverna style restaurants. There is a bakery and a great little supermarket which serves the many yachts and seems to sell everything. There is a "veg van" that turns up every morning and there is a lovely practice where a baker will do the rounds in a van dropping loaves off at houses which have left out a shopping bag (with €1.10). There are two super relaxed and sociable bars which play soft low key music which provide good starting and finishing points before and after dinner. There are two main options for travelling to Kioni. 1) Fly to Kefalonia, which is served by a number of UK airports and airlines (Monarch, Norwegian Air, Ryanair, EasyJet etc), where one can pick up a rental car or arrange a taxi to travel to Sami (takes 45 mins) from where two daily car ferries take the short hop across to Pisaetos, Ithaca. Kioni is about 45 mins away from Pisaetos. 2) Fly to Preveza from where one can rent a car or take a taxi (€60) to Nidri, Levkada from where a daily car ferry connects with Frikes, Ithaca. Frikes is just 10 mins away by car to Kioni. We bought the house in 2014 from the most charming couple who had beautifully and sympathetically renovated the house whilst developing and nurturing the terraced garden. We would like to spend more time there but kids and exams have limited our opportunity this summer. This is our first time renting it out so we have not done things on a commercial basis. It is very much our summer home! You should allow €75 for cleaning. We are presently living in southern Germany having originally come from Ireland. We have always dreamed of owning a house in the Ionian having spent time there during student days. It is everything that we wanted. It is frustrating that we cant spend more time there but with kids doing exams and work, it is a bit of a struggle. We are pleased though that the house is used when we are not there and it is also good for the village. As renting was never really on the agenda, the house has a homely, non-commercial, feel. We hope that our visitors appreciate and respect that. There is a bit of a nostalgic story but suffice to say that we travelled all the way to Kioni from the UK to view just one house. We knew immediately that this was it! From the moment we were met by Demetri in Fetia. and guided to our home for the week, to the moment we got in the car to leave, everything was perfect. The outdoor space in this house was fabulous - we had breakfast on the terrace, chilled out on the loungers and under the shaded pergola and just hung out and watched the boats go by on the chairs outside the living room. We loved the separation of the space with our two grown up daughters having their own space downstairs whilst we enjoyed the beautiful and tastefully decorated first floor accommodation. Kitchen was very well stocked and we cooked in the house on several evenings. Beds were really comfortable and showers great. All in all it was like being at home (although we always remembered it wasn’t ours) but with better weather and views that we can only dream of. The town and beaches of Kioni had everything we wanted and needed. Most mornings we headed to one of the two beaches on the right and the taverna on the second beach is run by a lovely Kionian family and opens for lunch every day and dinner twice a week. Iced coffees in the shade were very appreciated. The water in the bays (and everywhere in Ithaca) was crystal clear, warm and very easy to swim in. A pair of good beach shoes is helpful due to the pebbly nature of the beaches. The restaurants and bars in town are charming. We had a lovely dinner in Mills on the Hill and ended most evenings at the Spavento bar which played lovely jazz. The supermarket has everything you could need. We hired a boat from the harbour and took off for the day around the coast experiencing beaches only accessible by water - it was heaven. We also did a couple of afternoon hikes up to Agnoli (shoes and water needed) and out to a delightful church beyond the beach bar where we felt like the only people on earth. The walk to the Mills is very easy and also a lovely experience. You can probably tell that we simply loved our stay in this house and in Kioni and wouldn’t hesitate to return. It was the most chilled we’ve ever been at the end of a holiday and we all agreed that it was just perfect. It was a privilege to stay in this beautiful home - and it really is a home rather than a ‘commercial’ villa - in the most perfect location. The photos are nice but we were blown away by the reality of the place. The house is so comfortable and pretty, and well equipped, with the loveliest views imaginable. It has a wonderful roof terrace with a bbq, and above that, a fabulous sun terrace where you can watch the sunrise over the sea, and snooze away the afternoons. Kioni itself is heaven - we didn’t leave the village for 8 days! there are several lovely bathing beaches within moments walk of the house, with clear turquoise waters for swimming and snorkelling, and the village has a great choice of restaurants and local shops. The yachts coming and going add some cosmopolitan glamour. The local host Demitri was very helpful, especially in helping us get off the island when there was a ferry strike on our last day. Thanks very much for your kind words. So thrilled that you had such a lovely holiday. We are super lucky to have found our picturesque house in Kioni, which we love so much. Very happy that we have the opportunity to share our treasure with our guests. Gorgeous place. We loved our time here. Wonderful location about 7 mins walk to Kioni restaurants and two minutes from two wonderful little beaches where the swimming in the crystal clear waters was sublime. The house was perfect. Very charming, great balcony to sit out on and a large roof terrace with a bbq. The house was very well equipped too. A lived in feel but we didn’t mind that at all. We fell in love with ithica and Kioni. We will definitely be returning. The property was perfect for our needs: self-contained bedroom (and terrace) downstairs for our daughter and her partner, plenty of space for us upstairs. Well equipped and perfectly positioned a 10 minutes walk from the centre of Kioni, but only a few moments from a lovely little beach. End of May/Early June was an ideal time to visit. Weather great, sea warm, not too many people. We loved Ithaca. Thanks very much. Our accommodation was fabulous. The house itself is laid out on two levels, with a separate bedroom & shower room on the lower, and bedroom, bathroom, and a very welcoming and beautfully decorated living space (incl. kitchen area above. The living room had a balcony which looked down over Kioni, a very blue sea and the islands beyond. As if this wasn't enough, the outside stepped up the hillslope in a number of terraces - we were spoiled for choice on where to sit out! Kioni is a lovely location, much frequented by yachts mooring for the night. This makes the waterfront tavernas lively places of an evening. We really enjoyed our strolls down to the harbour, where we were able to find many restaurants offering good food at good prices, although the fayre became a bit repetitive after a while. We found some good local beaches, and Vathi, the main town on the island, is well worth a visit. Ithaca was undoubtedly the high spot of our island-hopping holiday, and I am so pleased that we chose to stay at this property. NOTE 1: A flat fee of €75, cash, must be paid for cleaning and laundry at the end of your stay. We ask that this money is left out on the kitchen table for the lady who looks after the house. NOTE 2: Greek Tax registration no (AMA) is 00000368007. I am required to display this. No need to do anything with this.